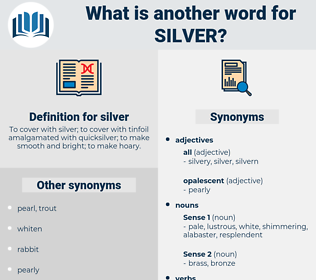 What is another word for silver? 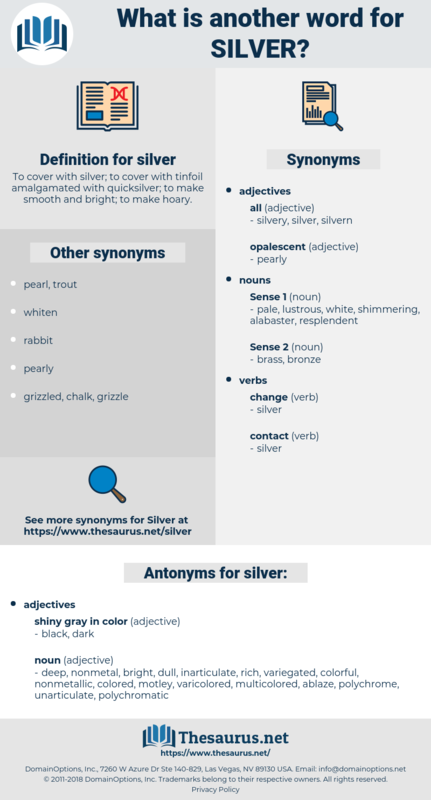 To cover with silver; to cover with tinfoil amalgamated with quicksilver; to make smooth and bright; to make hoary. deep, nonmetal, bright, dull, inarticulate, rich, variegated, colorful, nonmetallic, colored, motley, varicolored, multicolored, ablaze, polychrome, unarticulate, polychromatic. They went under one, - silver, green, and blue, and gold. There was faint rose in the sky, and a silver star. shlepper, solver, slobberer, self-aware, salvor, slivery, slaver, slip of paper, slipper, silvery, syllabary, slobber, sliver, slippery, sleepwear, salver, sloop of war, sleep over, sulfur, schlepper, squaw huckleberry, social welfare, salivary, social affair, sulphur, slabber, school paper, sleepover, slavery, Seckel Pear, sleeper, slapper, shellfire, scalper, shelver, silverware, slipover. colorise, discolor, colourize, Colour In, color in, color, colour, discolour, colorize, colourise. silver, ag, atomic number 47.